TSB have confirmed that they will be changing the opening hours of their Castle Douglas branch from the end of July 2019. "Our customers use banking services in different ways and the way they bank has and continues to change. That is why we try to adapt our offer with our customers and remain focused on offering brilliant service however a customer chooses to bank. We are determined to make significant efforts to keep branches with low footfall open by reducing opening hours. This is part of a concerted effort to reduce costs so that we can protect our physical presence. Customer usage of our Castle Douglas branch has been decreasing and has dropped by 3% in comparison to a year ago. In addition, 74% of customers also use another branch, digital or telephone banking to access TSB services. Rather than close the branch, we are reducing opening hours which will mean that from the end of July the Castle Douglas branch will now be open on Tuesday and Friday from 09.30-12.30 and 13.30-16.30. We know the important role branches play and therefore the days the branch is open have been selected to coincide with the times the branch is busiest. If a customer needs to access a TSB branch during a time in which TSB Castle Douglas is closed the nearest branch is Dumfries which is 17.6 miles away. Customers also have access to our digital and telephone banking services and can complete many personal banking tasks at the local Post Office at 100 King Street, Castle Douglas. There will be no job losses as a result of this change." Dumfries and Galloway College offers a wide range of qualifications and courses at further and higher education levels across a diverse curriculum. The Board of Management of the College is looking for people with a strong commitment to changing lives and an understanding of the value of education and training. This is an opportunity to make an important contribution to the strategic direction and governance of the College. You will be part of a Regional College Board at a time when colleges are recognised as playing a key role in the journey taken by learners from school to employment or to higher education. In addition to this, you will have the opportunity to be part of a team leading an organisation which contributes directly to economic growth through the provision of skills training for all ages, with an increased focus on the needs of employers. Board members would be required to attend meetings of the Board and some of its Standing Committees (around ten meetings per year, in the daytime). Board Members are not remunerated but reasonable out-of-pocket expenses arising from attendance on Board business are reimbursed. On commencement induction and training will be available. The Board of Management encourages applications from individuals representing all aspects of the communities of Dumfries and Galloway and would therefore welcome applications from under-represented groups (for example, in terms of age, gender, disability, ethnicity, religion and belief and LGBT identity). The essential criterion is for you to have an appropriate level of commitment, knowledge and experience to add value to the deliberations and work of the Board of Management. “This is a deeply disappointing decision but one that people have feared may happen in recent months. But needs to act as a wake up call to Government and national agencies that if they want major festivals and events to take place outwith the central belt they need to provide proper support to meet the extra costs this incurs instead of simply pumping millions of pounds every year into festivals in Edinburgh and Glasgow. "This is a huge loss for our region. Electric Fields has been hugely successful over the last few years and our Council has been proud to support them. We were aware there were concerns over the future of Electric Fields and I was disappointed that support from both the private and public sector nationally could not be secured. I would like to highlight the hard work put in my Nick Roberts as Festival Director and his efforts to try and keep the Festival at Drumlanrig. The loss of Electric Fields is a timely reminder of the challenges facing our tourism and events sector and the need for Council support going forward." The countdown to Dumfries and Galloway VOscars 2019 has officially begun. Hosted and organised by Third Sector Dumfries and Galloway, the event will once again celebrate the fantastic role and impact that volunteers and voluntary organisations have within the region. Castle Douglas Town Hall will host the awards on Thursday June 6 and the search now begins for worthy nominees from Portpatrick in the west across to Langholm in the east and everywhere else in between. Eight categories will give special recognition to individuals or groups that have excelled in the last year. The closing date for nominations is Sunday May 12 at 11pm. Independent panels will then select the final nominees to go forward for the top award. The categories this year are: individuals - Young Volunteer, Adult Volunteer, Board Member, Outstanding Contribution to Volunteering; organisations – Children and Young People, Social Enterprise, Community Group, and Inclusion Award. This year’s VOscars is kindly supported by Solway Print, Dumfries and Galloway Life and The People’s Project with award sponsors The Holywood Trust, Burns Development Trust, Dumfries and Galloway Chamber of Commerce, Andersons, Theatre Royal, Loreburn Housing, Dumfries and Galloway Council, and Dumfries and Galloway Equalities Partnership. For young people aged 12-25. This award recognises the unique contribution that young people make by bringing their passion, innovative ideas and vitality to the work of many organisations across Dumfries and Galloway. We are looking for a volunteer who has made a positive difference within your organisation, someone who has gone out of their way to help it succeed. For adults over 25. This award recognises the unique contribution that volunteers make in their communities. We are looking for a volunteer who is exceptional in their attitude, commitment or impact and shows true dedication to their role and input. For young people (12-25) and adults. Essential to the smooth running of any voluntary group, board members contribute to their organisations through serving on committees, fundraising, lobbying, campaigning and promoting. We are looking for someone whose commitment is intrinsic to the sustainability and development of the organisation and adds to the third sector as a whole. For young people (12-25) and adults. We are looking for someone who is recognised as an outstanding leader or role model while volunteering in any setting. The winner should have demonstrated remarkable dedication and impact through their volunteering, proved an inspiration to others through their contribution and be invaluable to their organisation. We are looking for volunteer involving organisations within Dumfries and Galloway that provide exceptional services to support and help children, young people and their families by providing safe, secure and fun environments to support, educate and develop young people across the region. generating income for its community or beneficiaries – particularly groups that show creativity and forward thinking to create a more sustainable future for themselves and their community. We are looking for a group that makes a real difference in their community. This could be by delivering or co-delivering a service or project; or managing or taking ownership of a local asset to address social and financial barriers – ultimately with the aim of improving the lives of their residents. We are looking for an organisation or individual within our region that is a symbol of promoting and celebrating equality, nurturing diversity and inclusion, and challenging inequalities and barriers, allowing others or themselves to realise their full potential. The event has been based in Dumfries & Galloway for more than 20 years and sponsored by Dumfries & Galloway Council in what is thought to be the longest partnership between a rally and a British local authority. As one of the longest running motorsport events in the UK, the Scottish Rally enters its 74th year in 2019 and will see the town of Moffat host the ceremonial start as well as the finish celebrations later that day. Competitors will then be in for a treat as organisers have laid out an all new-route, combining classic stages from the past with a new twist to old favourites to ensure competitors across the country can enjoy an action-packed day of rallying in the region. 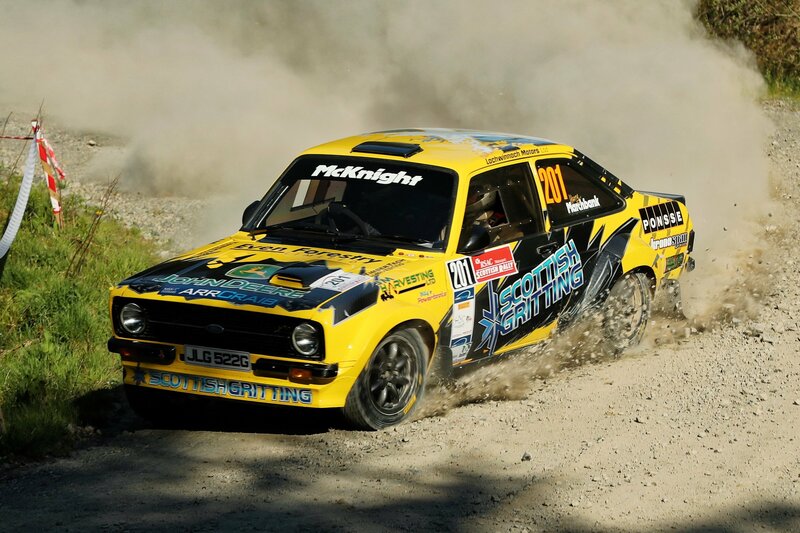 Joining the event once again will be some of the best rally drivers in Scotland as contenders from the KNC Groundworks Scottish Rally Championship head to Moffat for round three of the series. They will also be joined by the Border Challenge Rally Championship, the Northern Historic Rally Championship and the ever-impressive Armed Forces Land Rover Championship. Add to that, local crews and competitors from across the country looking to sample some famous forest stages and the 2019 RSAC Scottish Rally is looking like one of the strongest in many years. The event will be based as in previous years at Lockerbie Lorry Park which plays host to the pre-event technical checks and documentation ahead of the rally on Friday 17th May. Crews will then head into Moffat early on Saturday morning to be flagged away from the town centre before heading into the forests for over 40 miles of competitive driving in the nearby forests. Stages in Eskdalemuir will kick off proceedings with tests in the world-famous Castle O’er and Twiglees complex before heading to Lockerbie for the first service of the day. After a year away, organisers have secured the use of stages in Windy Hill and Ae forest which takes place before the second service halt. A final blast in the Eskdalemuir stages rounds off the event before heading back to Moffat to be greeted by the townsfolk and the finish celebrations. As well as the new-look route, the running order will also see a change from 2018. Thanks to the new Motorsport UK legislation introduced during last season, two-wheel drive crews will run first on the road to ensure they can sample some of the best road conditions during the day. They will be followed immediately by the four-wheel-drive heavy hitters, all vying to secure their name on the trophy alongside previous winners such as Colin McRae, Ari Vatanen, Hannu Mikkola and Stig Blomqvist. Rally fans will also be well catered for, with spectator viewing locations in Castle O’er and in Ae Forest with the Castle O’er test offering a different perspective to previous years thanks to a reversal of the stage.